Which Style Wedding Dress Bustle Should You Choose? When it comes to picking a wedding dress bustle how do you choose the best one for your gown? In this article you will learn the answer to this question plus the following frequently asked questions about bustling a wedding dress. What is a wedding gown bustle? Do I need to bustle my wedding dress? What are the various wedding gown bustle types? How do I know which one is best for my wedding gown? When should I have my bustle put up at my wedding? The above questions are frequently asked of me in my bridal alterations business. I will answer them for you below and show you various bustle types. "The bride in the picture to the right chose to have her chapel length train bustled into an American wedding dress bustle style." What Are The Types Of Bustles I Can Choose From? American Bustle - This style is also often called the "outer bustle" because your train is hooked up on the outside of the dress. 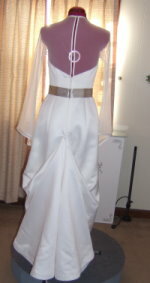 To do this there are buttons or hooks placed on the outside of your gown with corresponding loops. 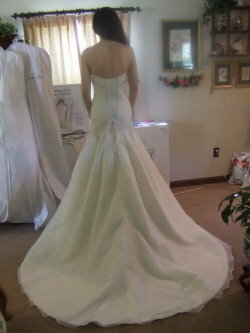 Ballroom Bustle - This wedding dress bustle style is sometimes called a "flip under or "flip up" bustle. With this type of bustle the train flips up under the dress and buttons are sewn to the skirt and loops are sewn to the hem of the train to button up. Once bustled, this train looks like a floor length dress all the way around. "In the above pictures you see a before picture of the train on the left. Then take a look at what the train looks like on the right after the ballroom bustle has been hooked up." How Do I Choose The Best Bustle For My Dress? Most of the time you will be shown either the American bustle or the French bustle. Have the seamstress show you both. 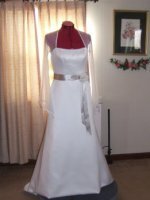 With help from the sewing professional you will be able to tell which one looks best with your dress. Most of the time one bustle style will look better than another. But in some cases each style bustle looks equally as good. In this case it's just a matter of which one you like the best. But when it comes to the ballroom bustle this one is used less often than the American and French wedding dress bustle styles. Why? Well... a lot of seamstresses are not familiar with doing a ballroom bustle. 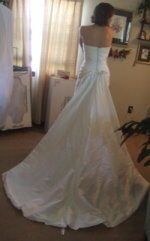 However, for certain style wedding dresses this is the best wedding dress bustle style to use. Another reason is that this is the most expensive bustle type because you usually need at least 11 or more button sets to hold the train up. So you will be the judge, together with the seamstress as to which bustle looks best and falls within your budget. "Above you see an American bustle style on the left and a French bustle on the right. On this particular dress both bustle styles looked nice." When Should I Put My Wedding Dress Bustle Up? This again depends on what you want to do. Some brides put their wedding gown bustle up before they walk into the reception. Others wait a while into the reception time and then before the first dance have it put up. Whether you decide to wait to put it up during the reception will depend on how easy it is to hook your bustle up. If it is easy... then you can wait and hook it up during the reception. If it is the American bustle this could be done in front of the guest without exposing the under part of your bridal dress. But if you have a French bustle or a Ballroom bustle... because the train of your dress will have to be lifted above your waist to tie it or button it up, you will need to have this done out of the sight of your guests. That is why most brides with these types of bustles often do so before they go into the reception. Otherwise, you would have to leave your reception to have the bustle put up. Who should you use to hook up your bustle at your wedding? One thing I tell my customers is to bring someone with them on their pick up day so that I can show them how to do the bustle. Who should you bring? I usually say it is best to have a bridesmaid or honor attendant do this. I don't suggest using your mother because they are usually busy with guest and hard to get a hold of. What if your wedding is out of town? If your wedding is out of town and no one lives near you to bustle your wedding dress,then the seamstress can show you how to do it when your dress is hanging on a hanger. To remember how to do your wedding dress bustle, you may want to have the seamstress draw a diagram for you. You can take pictures of how it is suppose to look after it is up. Also when you have a wedding out of town, once you arrive, take time to show the person who will do your bustle how it should be done while the gown is hanging on the hanger. One thing that seems to happen is that wedding dress bustles break, what causes this? The weight of the train pulls on the dress fabric, button or hooks, and the loops or ties. So over a number of hours under strain, something may give way. Think about it... the fabric of your gown is do something it wasn't meant to do, which is hold the weight of the train up. So if for some reason there is additional stress (like someone stepping on the train) the bustle buttons, loops or ties will give way. It is better for the button to pop off or the loop to break instead of having a hole ripped in your gown. Not much can be done to repair a hole or tear in a way that isn't visible. That is why as a seamstress... we will sew the ties, buttons and loops on good enough to hopefully hold the train up all night. But if it is sewn on too well, the gown will rip under stress. So a wedding dress seamstress will try to come somewhere in between being sewn on too lightly or too securely. Be prepared! Most of the time you will get through the day without a hitch. Just in case one of the points break, have some safety pins handy to pin it in place. You can also use a broach on a one point bustle to hold it up while at the same time add a decorative touch. One more point I want to say about wedding dress bustles... sometimes you have to do both the French and the American style bustle on your gown. This happens sometimes with gowns that have a chiffon or lace overskirt on top of a satin layer. In some of these cases, it is best to bustle the layers separately. Sometimes instead of doing the underskirt with the American wedding dress bustle and the overskirt the same type, you will do the underskirt in a French bustle and the overskirt in an American bustle. This way the bustle will lay flatter. 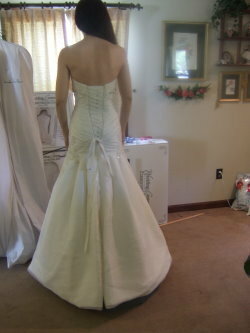 American Bustle Pictures And Tips - Read these tips and see pictures of an American bustle on a wedding gown. French Bustle Wedding Dress Pictures And Tips - If you are looking for pictures or examples of the French bustle style on bridal gowns... then check out this gallery!